To use the age calculator, select your birthday... The calculator will automatically update! Your birthdays and other information will show up in this display. Hover over the dates to get more information about each one. Explore other topics by choosing from this list! Find the difference between dates, friend's birthdays, elections and more! This age calculator allows you to enter your birthday and then it shows you each birthday for the next one hundred years. If you are asking yourself, "How many days until my birthday?" this calculator will show you that as well. If you hover over the birthday's in the left panel of the age calculator, you can see what day of the week your birthday lands on for your next birthday, future birthday days and past birthdays. The age calculator also uses your birthday to determine your western astrological sign and your Chinese astrological sign. If you find this calculator useful, be sure to check out some of the other calculators in the menu above, share this link with your friends on FaceBook or Pinterest, or link to the age calculator with the birthday or other facts you enter by copying the address at the bottom of the calculator itself. Your support is hugely appreciated! Your chronological age can be measured in many different ways. We typically start measuring age in terms of 'months old' when people are infants, but pretty quickly we simply report our age as the number of complete years that have elapsed since our birthday. But, if you have ever asked yourself, "How many days old am I?" or even "How many seconds old am I?" than this age calculator will tell you! In addition to years, the age calculator measures the number of whole months, weeks, days, hours, minutes or even seconds that have elapsed since your first birthday. For many of us, the difference between now and your birthday can be some very large numbers and it may make you think of some of the many things that have happened or that you have done since you were born! If you select one of the panels from 'Tell me about...' popup list near the bottom of the age calculator settings, you can learn more about other age related topics. This age calculator shows you exactly which day each of your birthdays will land on, so you can use it as past and present birthday calculator. Hover over the corresponding birthday in the left part of the age calculator display and it will show you what day of the week your birthday lands on. You can also calculate the age difference between yourself and a friend! Just below the main section of the age calculator, select 'My Friend's Birthday' and enter your friend's birthdate just below. The age calculator will show you the same information about the day of the week and astrological signs for your friend, along with the days between your two birthdays. If you've ever wondered exactly how much older or younger you are than your parents, sibling, spouse or significant other, this age calculator will tell you! What if you could travel back in time and invest $100 on your birthday, every birthday, from the day you were born? How much money would you have? What if you saved $10 every month for ten years? Whether your saving money on your birthday, or any other day, this age calculator includes a savings calculator function that allows you to enter an amount, interest rate and frequency. The calculator will show you how much money your savings grow into year after year. If you enter an inflation rate, the age calculator will figure out what the balance is adjusted for inflation over time. So while the power of compound interest ultimately prevails, also bear in mind that future money doesn't spend quite as nicely as money in your pocket today. Will you be elegibile to vote in the next presidential election? The age calculator will let you know! Presidential elections happen every four years on leap years, always on the Tuesday following the first Monday of the month. 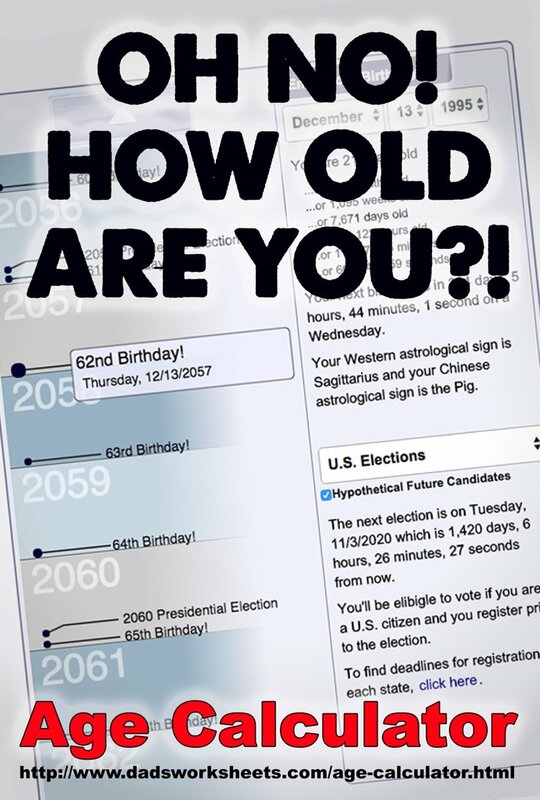 The age calculator will tell you which of the future elections is the first one where you will be eighteen. Some states require that you register to vote 30 days in advance of the election, so you may need to register in advance of your birthday if you want to vote. The age calculator will let you know and provides links to resources to help you figure out what the registration deadlines are in each state. The age calculator also predicts future presidential election candidates if you check the 'hypothetical candidates' check box. This is all in good fun, but I'm still rooting for the Roomba in the 2080 election! Note that while John Oliver was considered as a candidate for the 2036 election instead of Jon Stewart, he was disqualified, not because he wasn't born on U.S. territory which will probably be moot at that point due to the adoption of the One World Government, but rather because he voiced 'Vanity Smurf' in not one, but three movies, which should disqualify him from essentially doing anything. The age calculator would improperly calculate the months component of the elapsed time since your birthday during certain conditions in January. This has been corrected.